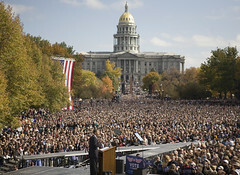 The latest Colorado Poll released (Denver Post-Mason Dixon) has Sen. Barack Obama leading John McCain by 5 points. Obama leads McCain 49 percent to 44 percent. Colorado unaffiliated voters, the critical voting bloc making up more than one-third of the state electorate, are backing Obama 57 percent to 32 percent. Four percent of those polled, however, were still undecided. I noted Friday that the Obamas have made four visits to Colorado in the past week and that Michelle Obama will be here Monday night. McCain and Palin have added last minute Colorado stops to their itineraries. Palin will be in Colorado Springs Monday while John McCain will be coming to Grand Junction, another Republican stronghold at noon on Election Day. Update: Police say more than 100,000 showed up to hear Obama. A pretty good slideshow of photos is here. Another is here. 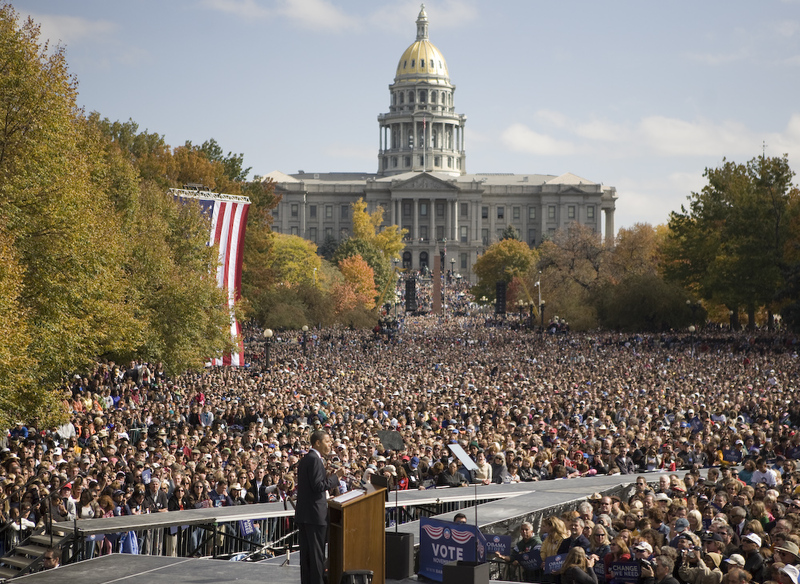 Bump and Update: 9 News is live streaming the Obama rally in Civic Center Park. He should arrive at any moment. 7 News streaming has a larger screen. The music has been very good so far. Update: He's speaking. "It's good to be back in Denver. It's good to be back in Colorado. Introduces Sen. Ken Salazar. Gov. Bill Ritter. Our soon to be Senator Mark Udall. Congresspersons Diana DeGette, Ed Perlmutter.Former Mayor Federico Pena. He asks how many have already voted. Loud cheers. He tells them to use the mail-in ballot, don't stand in line. He thanks everyone for the good wishes, cards, etc. on his grandmother. "Colorado, in just 9 days, you have the chance to elect your next President." He's beginning the prepared remarks, you can read them here. Once again, Gov. Sarah Palin talks out of both sides of her mouth. On CNN today, Sarah Palin was interviewed by Drew Griffin. I heard a portion driving home. She told Griffin that as Vice-President, McCain's roles for her will be (1) government reform (2) energy independence -- her "forte as governor" she said and (3) special needs children. In Colorado yesterday, Palin told 9News she opposes Amendment 51 on our ballot that would provide services to special needs children through a one cent sales tax increase on every $10 spent for the next two years. Colorado will be a hotly contested race in November. 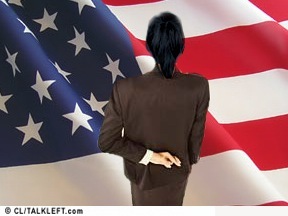 It's considered a toss-up, a red state that has trended bluer in recent years, although Bush won it in 2000 and 2004. How will this affect voter turnout, and which way? In November, Coloradans will be asked whether they favor amending the state constitution to include a provision that defines a "person" as "any human being from the moment of fertilization." Colorado for Equal Rights, the grassroots group seeking a measure to extend constitutional protections to the earliest individuals, fertilized eggs, succeeded in submitting more than enough valid voter signatures, the secretary of state said Thursday morning.